There is healthy M&A appetite out there for undervalued retail stocks. With more cash than ever being unlocked through tax cuts and repatriation, investors should expect to see more big buyout offers for retail stocks in the near future. Take for instance, Rite Aid Corporation (NYSE:RAD). Many thought it would never happen. But on February 20, the struggling pharmacy retailer got a buyout offer. It didn’t come from e-commerce giant Amazon.com, Inc. (NASDAQ:AMZN) as many expected (the suitor was privately owned Albertson’s). And the deal wasn’t that great for shareholders (see my analysis here of what I calculate to be roughly a 25% acquisition premium). But still, if the much maligned RAD stock can fetch a healthy acquisition premium, then other retailers should also be able to fetch nice acquisition premiums, too. Forgotten and left for dead, watch maker Fossil Group Inc (NASDAQ:FOSL) surged higher recently after the company reported not-so-bad fourth-quarter numbers. The whole narrative surrounding Fossil is that the company’s traditional watch business is being eaten alive by wearables (think Apple Watch). FOSL has been trying to fight back by building out its own wearables business which converges fashion and technology via hybrid watches. But for a while, that business hadn’t been ramping up quickly enough to offset declines in the traditional watch business. Recently, FOSL shows some serious momentum in its wearables business. The company’s hybrid smart watches accounted for 20% of total watch sales. That led to positive comps in the company’s watch business, and some semblance of stabilization on the top line. Top-line stabilization flowed through to margin stabilization, and suddenly, this secular decline narrative is turning around. A private buyout was apparently on the table before the Fossil’s blowout quarter. And this interest is likely even higher now that the company’s wearable business is showing signs of a bright future. Not too long ago, this was a company trading around $7 per share. $14 is just too cheap if this company can indeed stabilize its business through a wearables ramp, which looks likely now considering fourth quarter numbers. As such, I expect M&A interest surrounding FOSL stock to build over the next several months. I wouldn’t be surprised to see this stock get taken out at a big premium to its current $14 price. Finish Line Inc (NASDAQ:FINL) is another one of the severely beaten up retail stocks with healthy takeover interest. FINL has been victim of the retail landscape reshaping to be more direct and less wholesale. Big athletic brands like Nike Inc (NYSE:NKE) and Skechers USA Inc (NYSE:SKX) are pulling their product from less differentiated wholesale retail channels. Instead, they’re selling products in more differentiated direct retail channels, which include their own websites, their own stores and Amazon. 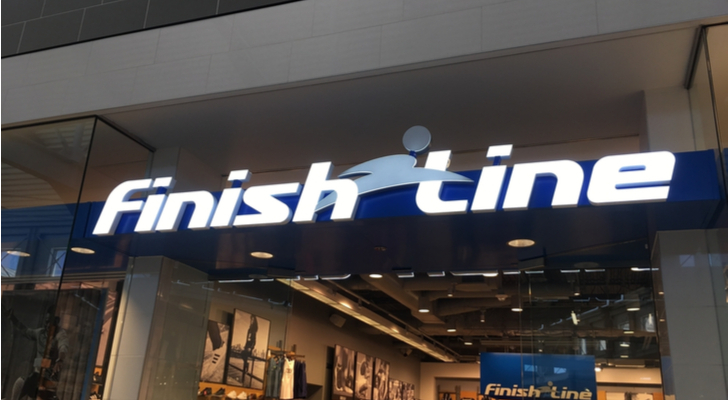 Finish Line doesn’t offer a truly differentiated retail experience. As such the company is gradually getting squeezed out by big athletic brands. But unless you think the whole wholesale athletic retail market is going to disappear soon, then FINL stock is undervalued. The stock trades at just 14.3-times this year’s earnings estimates. Cash flows are positive. The dividend yield is at a whopping 4.5%. Plus, there is $77 million of cash on the balance sheet. That is enough to cover 20% of the company’s current market cap. Perhaps due to this dirt cheap valuation, British retailer Sports Direct International Plc (LON:SPD) has acquired an 8% stake in FINL since the end of March 2017. Many analysts speculate that this accumulation is a sign that SPD wants to buy FINL. It’s also likely that U.S. peer Foot Locker, Inc. (NYSE:FL) makes a bid for FINL. As brick-and-mortar retail shrinks, it doesn’t make much sense for both FINL and FL to operate at max capacity alongside one another. Streamlining the two operations into one business with an optimized store footprint would make a ton of sense. All in all, I think its quite likely that FINL stock gets taken out at a healthy premium over the next several quarters. The suitor will likely be either FL or SPD. Target Corporation (NYSE:TGT) has actually excelled over the past several months. The company was getting killed by Walmart Inc (NYSE:WMT) for most of 2016 and part of 2017. But Target started fighting back in mid-2017 with a buffed out e-retail operation. Those efforts paid off. Comps have turned positive. Margins have stabilized. And TGT stock has soared. But the next leg up in TGT stock could come from an acquisition. Ever since e-commerce behemoth Amazon acquired Wholes Food Market, investors have been speculating as to what Amazon’s next move in offline retail will be. To me, the answer seems pretty obvious. Buying Target. Across the globe, digital retailers are all starting to build out offline retail presences. Amazon already acquired Whole Foods. Alibaba Group Holding Ltd (NYSE:BABA) has taken a massive stake in China’s top grocer. JD.Com Inc (ADR) (NASDAQ:JD) is opening hundreds of unmanned convenience stores. This a global trend, and it will continue because offline retail will always be around. Consequently, it’s easy to see why Amazon wants to continue to build out its offline retail presence. Target gives Amazon a way to do this at a reasonable price (15.5-times forward earnings). Plus, the two stores have the same core audience of affluent customers, which is also the same core audience for Whole Foods. Target also has a ton of locations across the U.S. That will help Amazon build out its Shipping with Amazon business. All in all, Target fits perfectly in Amazon’s high-end shopper wheelhouse. Consequently, I think its very likely that TGT stock gets taken out by AMZN at a healthy premium in the near future. As of this writing, Luke Lango was long FOSL, TGT, AMZN, NKE, and SKX. Article printed from InvestorPlace Media, https://investorplace.com/2018/02/3-retail-stocks-get-big-buyout-offers/.